How can I avoid mycoplasma contamination and other serious cell culture problems? | Bionique® Testing Laboratories, Inc. There are no secret tricks to avoiding mycoplasma contamination or other serious cell culture problems. It requires a full understanding of the nature and causes of the problems followed by the development of a comprehensive program to actively manage your cell cultures, laboratory facility and personnel (Coecke et al., 2005). The goals of the program should be to reduce or eliminate both the frequency and the seriousness of all cell culture problems, not limited only to those caused by mycoplasmas. The program should address all potential contaminants, chemical as well as biological. Additionally, strategies dealing with potential accidents, natural disasters or other events which could result in culture loss or the compromise of culture integrity also need to be place. The basic steps outlined in this section will assist you in providing the individual level of protection needed for your cultures. This is the goal of the Bionique® Safe Cells® Program. The first step is to evaluate the type of program that best meets your requirements. It can be simple and informal or more structured depending on the nature and applications of your work (Wolf and Quimby, 1973; Wolf, 1979). Smaller laboratories using a few cell lines may only require a very simple program. However, as the number of people and cell lines in the laboratory increase so do the benefits of a more structured program. In the biopharmaceutical industry Quality Assurance (QA) and Quality Control (QC) departments working in collaboration focus on the development and implementation of management programs to mitigate risk of contamination and deleterious cell culture events. Critical components of these plans are SOP’s (Standard Operating Procedures), CAPA (Corrective Action and Preventative Action), periodic internal QA inspections and data trending analysis which cumulatively provide continual assurance of a cell line’s purity and integrity. These activities are developed and conducted in accordance with appropriate regulations. Part of this evaluation is to review the sources and cause of past culture problems (Table 6a). Culture loss is most commonly caused by contamination but it can also result from accidents and equipment problems, such as incubator or freezer failures. Other very important, but often overlooked, sources of culture loss are the phenotypic and genotypic (mutational) changes that gradually accumulate in cultures over time. These changes occur as a result of cells undergoing cellular aging and adapting to the day to day stresses encountered in the unnatural in vitro environment. As a result, important cellular characteristics and functions may be altered or lost. This may also affect the reproducibility, reliability and comparability of experimental results. Lack of good record keeping, especially information on the cell culture’s history, characteristics and culture requirements often leads to a cell repository full of cultures that current laboratory personnel know little or nothing about (Coecke et al., 2005, Stacey and Masters, 2008). Failure to carefully document and preserve this critical information can also lead to culture loss. How much time, money and effort were spent to develop or obtain your cell cultures? Many widely used cell lines can be purchased for a few hundred dollars per vial. However, specialized and genetically engineered cultures used for the production of monoclonal antibodies, recombinant therapeutic proteins and vaccines come with significant costs, exceeding thousands of dollars. Besides the monetary expense, these cell lines often require investing an inordinate amount time and effort to establish or license (Stacey and Masters, 2008). How much will it cost and how difficult will it be to replace a lost culture or repeat a lost experiment or production run? Some cultures, such as hybridomas, may be truly irreplaceable. What are the consequences to your research, laboratory/facility and career, if important cultures become contaminated with mycoplasmas or are lost due to other causes, such as an accident or cross contamination by another cell line (Buehring et al., 2004)? Sometimes, researchers discover their cells lines are contaminated with mycoplasmas only after they send their cell lines to other researchers who then discover contamination when they test them. Carefully evaluating and answering these questions will help everyone better understand the effort required to protect and manage your cell cultures and your laboratory. The following five topics cover some of the most important areas needed to build a strong program to keep your cells safe. 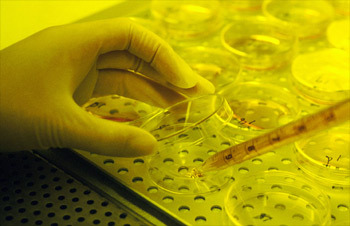 The leading cause of culture loss in most laboratories is microbial contamination resulting from poor or insufficient aseptic technique. 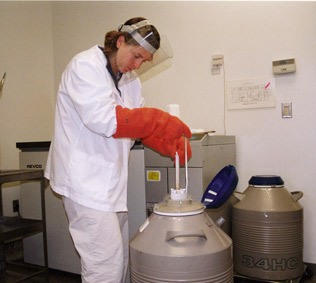 Developing successful aseptic techniques requires good training and knowledge of the nature and potential sources of contamination (Figure 6a). It is also essential to protect laboratory personnel from the exposure to potential infectious agents. Useful references on this subject include: Chapter 5 in Culture of Animal Cells: A Manual of Basic Technique (Freshney; 2000) and Understanding And Managing Cell Culture Contamination(Ryan; 2008a); these suggested references provide a sound introduction addressing these critical skills. In addition Bionique® Testing Laboratories has further developed its own guide, Helpful Hints for Better Aseptic Technique,that offers recommendations and information on improving your aseptic techniques and reducing the opportunity for culture contamination. New workers to the laboratory, as well as individuals with a history of recurrent contamination problems, should be carefully observed by a skilled operator to ensure their aseptic practices, culture techniques and fund of knowledge are satisfactory. Never assume someone’s techniques are good because they have been culturing cells for many years. A policy of reporting all culture contamination incidents, although likely to be unpopular, can help determine root causes and appropriate risk reduction strategies. While accidents affecting cell cultures cannot always be prevented, steps should be taken to both reduce the prevalence of these events and ensure that there are good recovery plans in place. Most laboratory accidents fall into two major categories: those people related and those that are not, such as natural disasters. However, no matter the cause, careful planning can greatly reduce the impact of cell culture and laboratory accidents. Cell culture accidents in which people play a key role sometimes result from over work but more often occur from lack of training and supervision. Examples of fairly common accidents are using the wrong medium or forgetting to add a key ingredient. More serious accidents are allowing an incubator’s CO2 supply to become depleted, or allowing the temperature or CO2 level to run too high or too low. While these accidents may not result in culture loss, they can seriously interfere with their growth and compromise any associated experiments. Perhaps the most serious (and yet relatively common) accident that can result in widespread culture loss is the failure of a liquid nitrogen freezer. This can occur if the freezer losses its insulating vacuum or the cap is not placed on properly. However, the most common cause is that the liquid nitrogen is not refilled when needed. Mechanical freezers are also prone to power failures or even the electrical plug being pulled accidentally from its outlet. If your laboratory does not have a back up supply of cells in another freezer, then you can lose all of your frozen cultures from a single event. These common incubator and freezer problems are easy to prevent by assigning individuals the responsibility for frequently monitoring and charting the level of liquid nitrogen in a freezer or the temperature and CO2 concentration in an incubator. Critical cultures should always be stored in more than one location. Inadequate record keeping and improper labeling of solutions and cultures often lead to mix-ups, misunderstandings and mistakes that can result in loss of both cultures and experimental data. Using standardized forms not only makes record keeping easier, it also sets expectations and makes it more likely that records will be kept. It also is important to have written directions or standard operating procedures (SOP's) and log sheets for many of the important tasks, including cell culture, done in the laboratory (Coecke et al., 2005). For example, log sheets for making media and reagents should include not only the lot and catalog numbers of the individual components but also reference the SOP followed. Running out of, or not being able to find media, sera, sterile plastic and glass labware or other reagents essential to maintaining the culture can quickly lead to culture loss. The larger the laboratory, the more opportunities there are for these problems to occur. Sometimes it is best to designate a single individual the responsibility of ordering and managing inventories of consumables. Managing the operations of a laboratory takes considerable effort and planning but ultimately affects the quality of work performed there (Coecke et al., 2005; Wolf, 1979). The second, much less common type of accidents is natural disasters. These include fires, floods (sometimes originating from leaky roofs, broken pipes or backed up drains within the facility), earthquakes, hurricanes, tornadoes, snowstorms and loss of electrical power. Many laboratories in the United States have been devastated as the result of hurricanes and the consequences of the flooding and long-term loss of electrical power. While these events are uncommon, when they occur the results on cultures and your research program are often devastating. Practical but solid recovery plans should be devised in the event that your laboratory is ever damaged or destroyed by one of these disasters. It is a question that requires serious thinking and discussion, especially concerning the protection of current and archived data and records, electronic documents and, of course, cell cultures. As mentioned in the How do mycoplasmas enter my cell cultures FAQ, cultures contaminated with mycoplasmas elsewhere and then transferred into a laboratory are probably the leading source of mycoplasma infected cultures today. This is a common problem when using “gifted” cell cultures from other laboratories. (In the long run these “free” cultures may turn out to be the most costly cultures you will ever obtain.) The best way to avoid this problem is to purchase cultures only from reputable cell repositories that have vigorous testing programs and certify their cell lines as authenticate and free of microbial contamination. Cultures obtained from other sources should be kept quarantined in a separate incubator until mycoplasma test results are available. If a separate incubator is unavailable then the culture should be grown in a sealed flask and kept inside a plastic box with a cover or lid. Do not use unsealed dishes or plates. The suspect cultures should only be handled at the end of the workday after all other cell culture work is complete. All media, solutions and plastic ware that are used with these cultures should also be segregated from the other culture materials and supplies. The laminar flow hood should be carefully disinfected afterwards. Ideally, the antibiotics used for cell culture should meet the following criteria: 1) eliminate all microbial contaminants; 2) nontoxic to the host cells; 3) do not interfere with experimental results (Perlman, 1979). Unfortunately, there are no antibiotics available that meet these requirements. Consequently, microbial contamination continues to be problematic in cell culture laboratories that routinely rely on using antibiotics in their culture media rather than good aseptic practices. Understanding the role antibiotics play in mycoplasma contamination and using them correctly is critical to preventing contamination but is discussed in greater detail in the two previous FAQs: Why do contamination rates continue to be high? and Why does over use of antibiotics result in higher mycoplasma contamination rates? Once successfully frozen and stored, cryogenically preserved cultures provide an important backup supply for replenishing cell cultures following damages or losses from accidents or cross contamination from other cell lines or microorganisms. A retained frozen master stock is a key component to any Safe Cells® Program. As an added benefit, they can be used strategically to maintain cell culture quality. Cell lines can be replenished every two to three months as an alternative to the use of continuous long term cultures. For practical guidance on cryopreservation of cell lines and suggestions on managing a cell repository read our technical articles. Provides reliable and consistent culture for use in research and biopharmaceutical production due to the limited passage number. As a result of in vitro cellular aging and evolution, phenotypic and genotypic drift and damage occur and accumulate in all actively growing cell cultures (Hughes et al., 2007; Stacey and Masters, 2008). Fortunately, cryogenically preserved cultures do not undergo any detectable changes once they are properly frozen and then stored below -130°C. The biological effects of in vitro cellular aging and evolution may be minimized by periodic regeneration of your stock cultures every two to three months depending on your needs and situation. This approach allows ongoing long-term culture experiments to be successfully completed without these unwanted variables. If these master cell banks are certified by undergoing appropriate quality control and safety testing prior to cryopreservation, then the immediate need for testing upon recovery is eliminated with appreciable savings in time and money. Cultures that are continuously grown in the laboratory should be tested for mycoplasma at a minimum every two to three months to prevent a single infected culture from cross contaminating other cultures. By discarding cultures after short-term use and replacing them with fresh cultures from a certified cell stock, reliability and reproducibility of the cell cultures are preserved (Stacey and Masters, 2008). The key requirement for creating a cyropreserved cell bank is to have a fully validated frozen cell stock created from pooled cells for each of the important cultures used in your laboratory (Figure 6b). Figure 6b - A cell repository containing properly validated frozen culture is often the most valuable item in your laboratory.Using pooled cells guarantees that the contents of all vials from the pool will be identical so that the characteristics and performance of these cultures after thawing and recovery should be the same. This frozen cell bank should be large enough (perhaps a hundred or more vials) to meet all the foreseeable needs of your program. However, since many laboratories have limitations on freezer space as well as the difficulties of simultaneously freezing a large number of vials, a simpler and more economical approach is often needed. A very flexible and practical approach, in these situations, is to adapt the two stage cell banking method often used by companies producing cell-based therapeutics. Rather than growing up a large batch of cells and pooling them to create a single bank of a hundred frozen vials, a two stage approach is employed. In the first stage a smaller amount of cells is grown, harvested, pooled and frozen to create a seed stock. Then a single vial from this seed stock is thawed and cultured (one to two passages) until there are enough cells to produce an initial working stock. One vial is then recovered from this working stock. Careful quality control testing is conducted to verify viability, authenticity, characterization and absence of microbial or other contaminants. Future cell needs for the laboratory are then met by drawing vials only from the validated working stock. Once this original working stock has been depleted, a second working stock is produced by thawing another vial from the original seed stock and repeating the process. A vial from this new working stock should be tested and processed in the same manner as the original working stock. Thereafter, additional working stocks can be produced from the remaining seed stock vials as required. Figure 6c - Setting up master and working stocks with ten vials in each creates a cell bank which has the potential capability of providing 100 vials. e the 10 vials for the initial working stock. Thus even though only 20 vials have been produced, the potential is there to expand and create eight more working stocks before the last remaining vial in the original seed stock must be used to create a new seed stock. In this example the two stage cell banking approach only required about 20% of the storage space required by the single stage approach. In addition, the two stage approach is much more flexible since it is easy to adjust the number of vials created for future working stocks based on need as well as available storage space. Fin more information on setting up cell banks designed to support your long-term research needs in our creating a certified working cell bank article. Once a working cell stock has been completely qualified, it is important to record all information available about the cell culture’s identity, characteristics, passage level, culture medium and condition requirements, and quality control testing results. Keeping accurate and detailed records is often overlooked as a vital part of maintaining a frozen cell repository (Freshney 2000; Coecke et al. 2005). In reality, these cell stocks may out last the individual who created them. Therefore, it is essential that all corresponding documents be clear and self explanatory. Last, but not least, be prepared for emergencies. Accidents and mistakes involving liquid nitrogen freezers, resulting in the catastrophic loss of cryopreserved cells, are terrible but all too common events. Frequently check nitrogen levels in freezers; a schedule should be established and strictly adhered to. Alarm systems for detecting low liquid nitrogen levels are also available to provide additional safeguards. However, these devices may provide a false sense of security if not monitored 24 hours a day. Valuable or irreplaceable cultures should be stored in more than one freezer, preferably in at least two separate facilities. The next section provides recommendations on which tests are best for mycoplasma detection.